In 1997, William Ryan, Walter Pitman and their colleagues first published the Black Sea deluge hypothesis. They proposed that a catastrophic inflow of Mediterranean seawater into the Black Sea freshwater lake occurred at 7,200 BP. Before that date, glacial meltwater had turned the Black and Caspian Seas into vast freshwater lakes draining into the Aegean Sea. As glaciers retreated, some of the rivers emptying into the Black Sea declined in volume and changed course to drain into the North Sea. The levels of the lakes dropped through evaporation, while changes in worldwide hydrology caused overall sea level to rise. The rising Mediterranean finally spilled over a rocky sill at the Bosporus. The event flooded 155,000 km2 (60,000 sq mi) of land and significantly expanded the Black Sea shoreline to the north and west. According to the researchers, "40 km3 (10 cu mi) of water poured through each day, two hundred times the flow of Niagara Falls. The Bosporus valley roared and surged at full spate for at least three hundred days. They argued that the catastrophic inflow of seawater resulted from an abrupt sea-level jump that accompanied the Laurentide Ice Sheet collapse and the following breaching of a bedrock barrier in the Bosporus strait. As proposed, the Early Holocene Black Sea flood scenario describes events that would have profoundly affected prehistoric settlement in eastern Europe and adjacent parts of Asia and possibly was the basis of oral history concerning Noah’s Flood. Some archaeologists support this theory as an explanation for the lack of Neolithic period sites in northern Turkey. In 2003, Ryan and coauthors revised the dating of the Early Holocene Noah’s Flood to 8,400 BP. Popular discussion of the Early Holocene Black Sea flood scenario proposed by William Ryan, Walter Pitman and their colleagues was headlined in The New York Times in December 1996. and later published as a book. In 2003 and 2007, a different catastrophic flood scenario was proposed for the Late Quaternary sea level rise of the Black Sea. 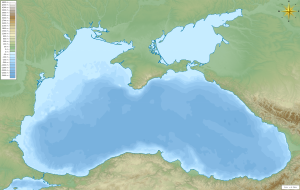 The hypothesis for their Late Pleistocene Great Flood argues that brackish Neoeuxinian Lake, which occupied the Black Sea basin, was rapidly inundated by glacial meltwater overflow from Caspian Sea via the Manych-Kerch Spillway shortly after the Late Glacial Maximum, about 17,000–14,000 BP. These extensive meltwater flooding events linked several lacustrine and marine water bodies starting with the southern edge of the Scandinavian and southward, through spillways to the Manych-Kerch and Bosphorus, ultimately forming what has been referred to as the Cascade of Eurasian Basins. This event is argued to have caused a rapid, if not catastrophic rise in the level of the Black Sea. Theoretically it would have imposed substantial stresses upon coeval human populations and remained in cultural memory as the Great Flood. The authors also suggested that the event might have stimulated the beginning of shipping and horse domestication. In addition to the Early Holocene Noah’s Flood scenario proposed by William Ryan, Walter Pitman and their colleagues and the Caspian Sea overflow scenario proposed by Andrei L. Chepalyga, the non-catastrophic progressive flood model (or gradual inflow model) has been proposed to explain the Late Quaternary sea level history of the Black Sea. For the progressive flood model, it is argued that as early as 11,000 or 10,000 BP, the level of the Black Sea rose above the shallowest sill depth of about 30 m (98 ft) in the Bosporus Strait and spilled into the Marmara Sea. At least for the first 1,000 years this connection was a one-way outflow of the Black Sea into a very shallow Marmara Sea. At about 8,000 BP, the level of the Marmara Sea rose high enough such that a two-way flow started. The evidence used to support this scenario includes the disparate ages of sapropel deposition in the eastern Mediterranean Sea and Black Sea; buried backstepping barrier islands observed on the Black Sea shelf; and a sub-aqueous delta composed of Black Sea sediments in the Marmara Sea near the Bosporus Strait. Since the ending of the last glacial period the global sea level has risen some 120 m (390 ft). The process took approximately 10,000 years and abated about 7,600 years ago. Various methods have been used to study and date (e.g., sea floor drillings, radiocarbon dating, biological markers) the recent evolution of the Black Sea. The heterogeneous data do not fit into a neat frame, which precludes the confirmation for a sharply defined event. The Black Sea flood hypothesis concerns an event supposed to have occurred during the last 10,000–12,000 years[clarification needed] with the water level rising rapidly enough to cause easily noticeable effects. Opponents of the deluge hypothesis point to clues that water has been flowing out of the Black Sea basin as late as 15,000 years ago. The local level must have been higher than the current-then-global level which had already risen from the last glacial minimum. In order to produce a Black Sea flooding such as the one described by Ryan and Pitman a solid obstruction of the Turkish Straits should have occurred. It must have had a significant height to allow for a rise on the south side, while to the north the water level should have been dropping. A notable point here is that the low lands in the Black Sea's basin would have already been flooded. In this alternative scenario, much depends on the evolution of the Bosphorus. According to a study from 2001 the modern sill is 32–34 m (105–112 ft) below sea level, and consists of Quaternary sand over-lying Paleozoic bedrock in which three sills are found at 80–85 m (260–280 ft) below sea level. Sedimentation on these sills started before 10,000 years ago and continued until 5,300 years ago. According to a 2009 study by Liviu Giosan, Florin Filip [ro], and Stefan Constatinescu, the level in the Black Sea before the marine reconnection was 30 m (100 ft) below present sea level, rather than the 80 m (260 ft), or lower, of the catastrophe theories. If the flood occurred at all, the sea level increase and the flooded area during the reconnection were significantly smaller than previously proposed. It also occurred earlier than initially surmised, c. 7400 BCE, rather than the originally proposed 5600 BCE. Since the depth of the Bosphorus, in its middle furrow, at present varies from 36 to 124 m (118 to 407 ft), with an average depth of 65 m (213 ft), a calculated stone age shoreline in the Black Sea lying 30 m (100 ft) lower than in the present day would imply that the contact with the Mediterranean might never have been broken during the Holocene, and hence there could have been no sudden waterfall-style transgression. A February 2009 article reported that the flooding could have been "quite mild". A 2016 study reviewed the evidence accumulated and reaffirmed the catastrophic scenario (Project: DO02-337 "Ancient coastlines of the Black Sea and conditions for human presence", sponsored by Bulgarian Scientific Fund). ^ a b c Yanko-Hombach, V., Mudie, P., and Gilbert, A. S., 2011, Was the Black Sea catastrophically flooded during the post-glacial? Geological evidence and impacts, in Benjamin, J. et al. (eds. ), Underwater Archaeology and the Submerged Prehistory of Europe: Oxbow Books, p. 245–262. ^ a b c Ferguson, S. (2012). Evaluation of Pleistocene to Holocene (MIS 5 to 1) climatic changes in southwestern Black Sea: a palynological study of DSDP Site 380. Master’s thesis, Department of Geology and Geophysics, Louisiana State University and Agricultural and Mechanical College, Baton Rouge, LA. 64 pp. ^ a b c Ryan, W. B. F.; Pitman, W. C.; Major, C. O.; Shimkus, K.; Moskalenko, V.; Jones, G. A.; Dimitrov, P.; Gorür, N.; Sakinç, M. (1997). "An abrupt drowning of the Black Sea shelf" (PDF). Marine Geology. 138 (1–2): 119–126. CiteSeerX 10.1.1.598.2866. doi:10.1016/s0025-3227(97)00007-8. Archived from the original (PDF) on 2016-03-04. Retrieved 2014-12-23. ^ Ballard, R. D.; Coleman, D. F.; Rosenberg, G. D. (2000). "Further evidence of abrupt Holocene drowning of the Black Sea shelf". Marine Geology. 170 (3–4): 253–261. doi:10.1016/S0025-3227(00)00108-0. ^ Hiebert, F. T. (2001). "Black Sea Coastal Cultures: Trade and Interaction". Expedition. 43: 11–20. ^ Özdoğan, M. (2011). "Submerged Sites and Drowned Topograhies along the Anatolian Coasts: An Overview". In Benjamin, J.; Bonsall, C.; Pickard, C.; Fischer, A. Submerged Prehistory. Oxford: Oxbow. pp. 219–229. ^ a b Ryan, W. B.; Major, C. O.; Lericolais, G.; Goldstein, S. L. (2003). "Catastrophic flooding of the Black Sea". Annual Review of Earth and Planetary Sciences. 31 (1): 525−554. doi:10.1146/annurev.earth.31.100901.141249. ^ Wilford, John Noble (1996). "Geologists Link Black Sea Deluge To Farming's Rise". The New York Times. Retrieved 17 June 2013. ^ Ryan, W.; Pitman, W. (1998). Noah's Flood: The New Scientific Discoveries about the Event that Changed History. New York: Touchstone. p. 249. ISBN 978-0684810522. ^ a b Chepalyga, A.L., 2003. Late glacial great flood in the Black Sea and Caspian Sea. Geological Society of America Abstracts with Programs, 35(6), pp. 460. ^ a b c Chepalyga, A. L. (2007). "The late glacial great flood in the Ponto-Caspian basin". In Yanko-Hombach, V.; Gilbert, A. S.; Panin, N.; Dolukhanov, P. M. The Black Sea Flood Question: Changes in Coastline, Climate, and Human Settlement. Dordrecht: Springer. pp. 118−148. ISBN 9781402053023. ^ Ferguson, S.; Warny, S.; Escarguel, G.; Mudie, P. J. (2018). "MIS 5–1 dinoflagellate cyst analyses and morphometric evaluation of Galeacysta etrusca and Spiniferites cruciformis in southwestern Black Sea". Quaternary International. 465 (465): 117−129. doi:10.1016/j.quaint.2016.07.035. ^ Aksu, A. E.; Hiscott, R. N.; Mudie, P. J.; Rochon, A.; Kaminski, M. A.; Abrajano, T.; Yaar, D. (2002). "Persistent Holocene outflow from the Black Sea to the Eastern Mediterranean contradicts Noah's Flood hypothesis". GSA Today. 12 (5): 4−10. doi:10.1130/1052-5173(2002)012<0004:PHOFTB>2.0.CO;2. ^ Aksu, A. E.; Hiscott, R. N.; Kaminski, M. A.; Mudie, P. J.; Gillespie, H.; Abrajano, T.; Yaşar, D. (2002). "Last glacial–Holocene paleoceanography of the Black Sea and Marmara Sea: stable isotopic, foraminiferal and coccolith evidence". Marine Geology. 190 (1−2): 119−149. doi:10.1016/S0025-3227(02)00345-6. ^ Hiscott, R.N., Aksu, A.E., Mudie, P.J., Marret, F., Abrajano, T., Kaminski, M.A., Evans, J., Çakiroğlu, A.İ. and Yaşar, D., 2007. A gradual drowning of the southwestern Black Sea shelf: evidence for a progressive rather than abrupt Holocene reconnection with the eastern Mediterranean Sea through the Marmara Sea Gateway. Quaternary International, 167, pp.19-34. ^ Goldberg, S.; et al. (2016). "The timing of the Black Sea flood event: Insights from modeling of glacial isostatic adjustment". , Earth and Planetary Sci. Lett. 452: 178–84. doi:10.1016/j.epsl.2016.06.016. ^ Aksu, A. E.; Hiscott, R. N.; Yaltırak, C. (2016-10-01). "Early Holocene age and provenance of a mid-shelf delta lobe south of the Strait of Bosphorus, Turkey, and its link to vigorous Black Sea outflow". Marine Geology. 380: 113–137. doi:10.1016/j.margeo.2016.07.003. ^ Algan, O.; Cagatay, N.; Tchepalyga, A.; Ongan, D.; Eastoe, C.; Gokasan, E. (2001). "Stratigraphy of the sediment infill in Bosphorus Strait: water exchange between the Black and Mediterranean Seas during the last glacial Holocene". Geo Mar. Lett. 20 (4): 209–218. doi:10.1007/s003670000058. ^ Goldberg, Samuel L.; Lau, Harriet C. P.; Mitrovica, Jerry X.; Latychev, Konstantin (2016-10-15). "The timing of the Black Sea flood event: Insights from modeling of glacial isostatic adjustment". Earth and Planetary Science Letters. 452: 178–184. doi:10.1016/j.epsl.2016.06.016. ^ Yanko-Hombach, Valentina; Gilbert, Allan S; Panin, Nicolae (2007). Dolukhanov, Pavel M, ed. The Black Sea Flood Question: Changes in Coastline, Climate and Human Settlement. Netherlands: Springer. doi:10.1007/978-1-4020-5302-3. ISBN 978-1-4020-5302-3. ^ a b Giosan, Liviu; Filip, Florin; Constatinescu, Stefan (2009-01-01). "Was the Black Sea catastrophically flooded in the early Holocene?" (PDF). Quaternary Science Reviews. 28 (1–2): 1–6. doi:10.1016/j.quascirev.2008.10.012. ^ ""Noah's Flood" Not Rooted in Reality, After All?". news.nationalgeographic.com. Retrieved 2017-05-09. ^ Mertens, Kenneth Neil; Bradley, Lee R.; Takano, Yoshihito; Mudie, Petra J.; Marret, Fabienne; Aksu, Ali E.; Hiscott, Richard N.; Verleye, Thomas J.; Mousing, Erik A. (2012-04-16). "Quantitative estimation of Holocene surface salinity variation in the Black Sea using dinoflagellate cyst process length". Quaternary Science Reviews. 39: 45–59. doi:10.1016/j.quascirev.2012.01.026. ^ Yanchilina, Anastasia G.; Ryan, William B. F.; McManus, Jerry F.; Dimitrov, Petko; Dimitrov, Dimitar; Slavova, Krasimira; Filipova-Marinova, Mariana (2017-01-01). "Compilation of geophysical, geochronological, and geochemical evidence indicates a rapid Mediterranean-derived submergence of the Black Sea's shelf and subsequent substantial salinification in the early Holocene". Marine Geology. 383: 14–34. doi:10.1016/j.margeo.2016.11.001. Gökaşan, E.; Algan, O.; Tur, H.; Meriç, E.; Türker, A.; Şimşek, M. (2005). "Delta formation at the southern entrance of Istanbul Strait (Marmara sea, Turkey): a new interpretation based on high-resolution seismic stratigraphy". Geo-Marine Letters. 25 (6): 370–377. doi:10.1007/s00367-005-0215-4. Eris, K.; Ryan, W. B. F.; Cagatay, N.; Sancar, Ü.; Lericolais, G.; Menot, G.; Bard, E. (2008). "The timing and evolution of the post-glacial transgression across the Sea of Marmara shelf south of İstanbul". Marine Geology. 243 (1–4): 57–76. doi:10.1016/j.margeo.2007.04.010. Dimitrov, Petko. ; Dimitrov, Dimitar. 2004. The Black Sea, the flood, and the ancient myths. Varna (Bulgaria): Slavena. Keith, M.L. ; Anderson, G.M. (1963). "Radiocarbon Dating: Fictitious Results with Mollusk Shells". Science. 141 (3581): 634–637. doi:10.1126/science.141.3581.634. PMID 17781758. Ryan, W.B.F. ; Pitman III, W.C.; et al. (1997). "An abrupt drowning of the Black Sea shelf" (PDF). Marine Geology. 138 (1–2): 119–126. CiteSeerX 10.1.1.598.2866. doi:10.1016/s0025-3227(97)00007-8. Archived from the original (PDF) on 2016-03-04. Retrieved 2014-12-23. Giosan, Liviu; et al. (2009). "Was the Black Sea catastrophically flooded in the early Holocene?". Quaternary Science Reviews. 28 (12–2): 1–6. doi:10.1016/j.quascirev.2008.10.012. Lericolais, G.; et al. (2009). "High frequency sea level fluctuations recorded in the Black Sea since the LGM". Global and Planetary Change. 66 (1–2): 65–75. doi:10.1016/j.gloplacha.2008.03.010. This page was last edited on 20 February 2019, at 00:32 (UTC).